Columbia University Press, 9780231158022, 256pp. 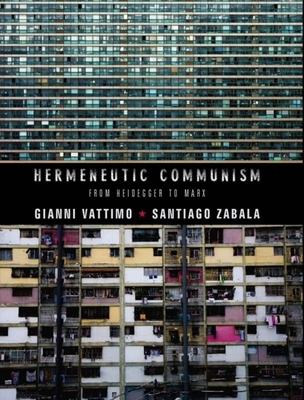 Separating communism from its metaphysical foundations, which include an abiding faith in the immutable laws of history and an almost holy conception of the proletariat, Gianni Vattimo and Santiago Zabala recast Marx's theories at a time when capitalism's metaphysical moorings--in technology, empire, and industrialization--are buckling. While Michael Hardt and Antonio Negri call for a return of the revolutionary left, Vattimo and Zabala fear this would lead only to more violence and failed political policy. Instead, they adopt an antifoundationalist stance drawn from the hermeneutic thought of Martin Heidegger, Jacques Derrida, and Richard Rorty. Gianni Vattimo is emeritus professor of philosophy at the University of Turin and a member of the European Parliament. His books with Columbia University Press include A Farewell to Truth; The Responsibility of the Philosopher; Christianity, Truth, and Weakening Faith: A Dialogue (with R. Girard); Not Being God: A Collaborative Autobiography (with P. Paterlini); Art's Claim to Truth; After the Death of God (with John D. Caputo); Dialogue with Nietzsche; The Future of Religion (with Richard Rorty); Nihilism and Emancipation: Ethics, Politics, and Law; and After Christianity. Santiago Zabala is ICREA Research Professor at the University of Barcelona. He is the author of The Remains of Being: Hermeneutic Ontology After Metaphysics and The Hermeneutic Nature of Analytic Philosophy: A Study of Ernst Tugendhat; editor of Art's Claim to Truth, Weakening Philosophy, Nihilism and Emancipation, and The Future of Religion; and coeditor (with Jeff Malpas) of Consequences of Hermeneutics.